Here at the Park Database, we like to crunch a lot of data. In doing so, we can’t help but notice patterns and ways of abstracting what initially look like complex subjects. Today, we turn our attention to waterparks. We’ve run the numbers on hundreds of waterpark projects and thousands of individual waterpark attractions in our database. What did we find? More than 80% of all waterpark projects in the world have bodyslide, explore/play structures, and pools. 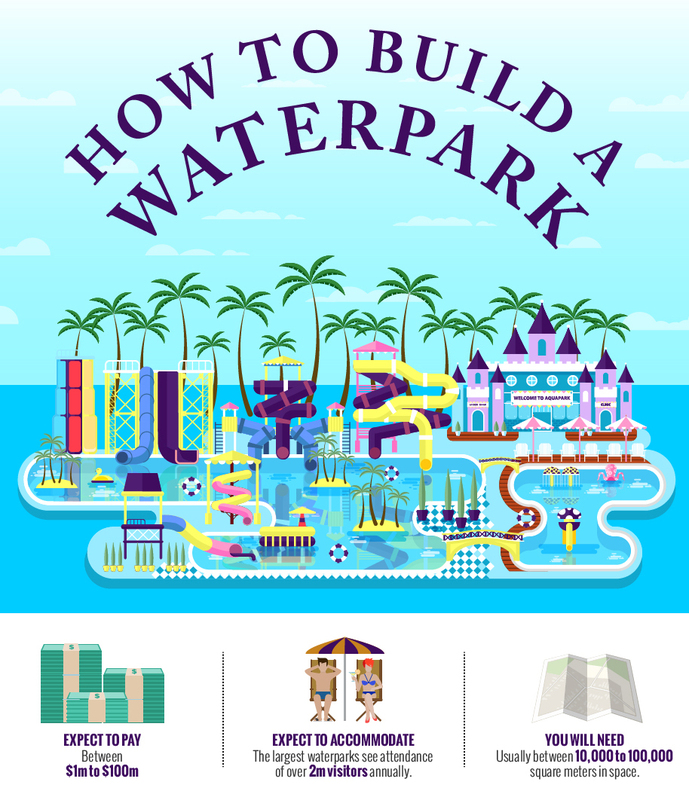 More than 70% of all waterpark projects in the world have raft or tube rides, or rivers. 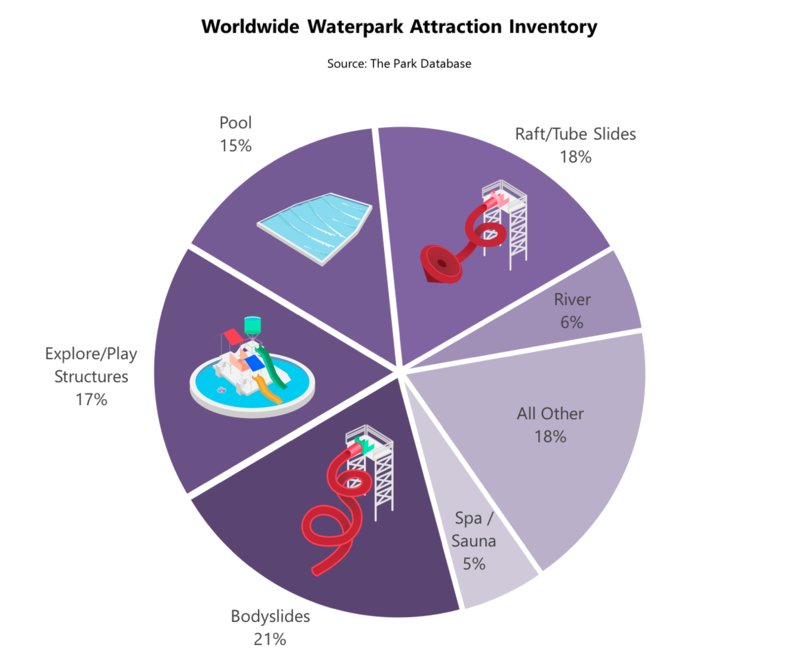 If we perform a detailed segmentation of all the types of individual waterpark attractions in our database, we see that slides (including both bodyslides and raft/tube variations), are the single largest group of attractions, at 40% of the entire worldwide inventory. Play structures are 17% of the total, while pools and rivers together comprise approximately 20%. Note that these are raw counts of individual slides, pools, rivers, and other attractions. 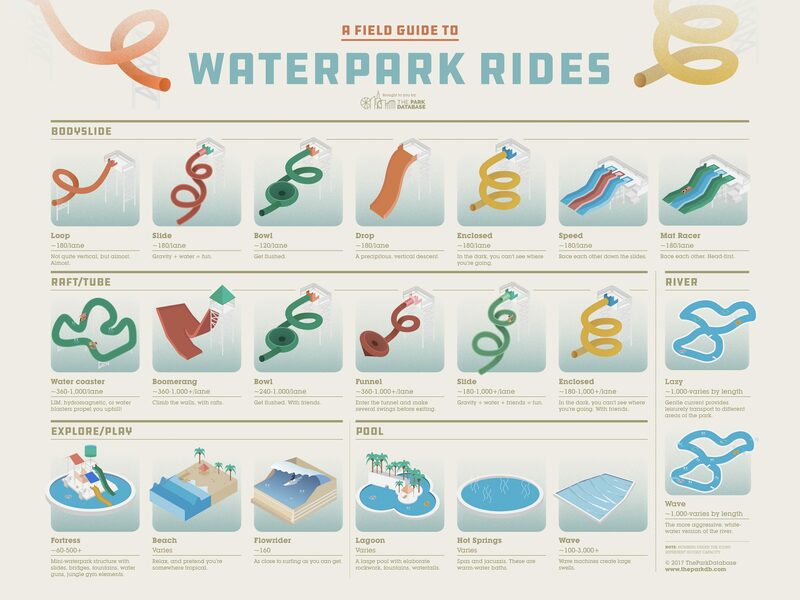 So while rivers are in more than 70% of waterparks in the world, there are usually only 1 or 2 of them per park. This accounts for them being only 6% of the total attraction inventory, as per the below. Bodyslides and raft/tube slides can be segmented even further into subtypes. Mixed or generic slides are the biggest group in either segment. We use the word ‘generic’ respectfully here; it doesn’t mean these rides aren’t fun or thrilling, just that they are not easily classified with one singular feature, such as a drop, boomerang, bowl, or loop. With bodyslides, speed-related slides are the most popular and numerous in the worldwide inventory. Drop slides (featuring a steep vertical descent) -and racing slides, such as mat racers or speed slides, are each 20% of the bodyslide inventory count. Enclosed slides are another major group, at 20%. Within the raft or tube category, enclosed slides are single biggest identifiable sub-type, at over 20% of the total inventory. These are slides that are completely enclosed – and dark, so riders don’t know where they’re going. 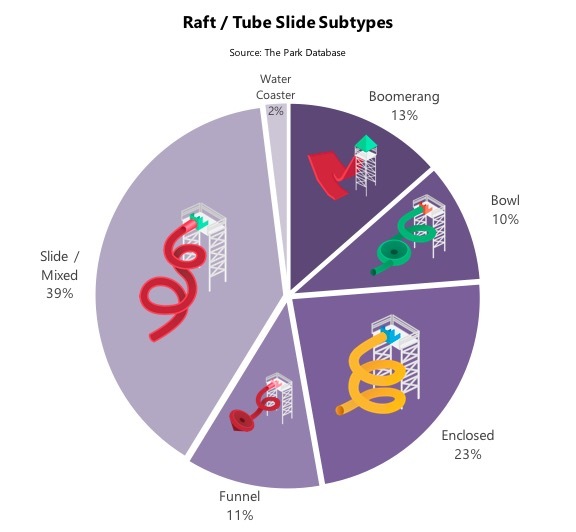 Other features such as boomerang, bowls, and funnels are over 10% of the raft/tube slide inventory each. It is important to note that these are worldwide averages, so they don’t take into account regional differences, of which there are many. For example, waterparks located in the higher latitudes tend to have more hot springs and indoor components, while many waterparks in Latin America often are composed almost entirely of pools, with very few slides. 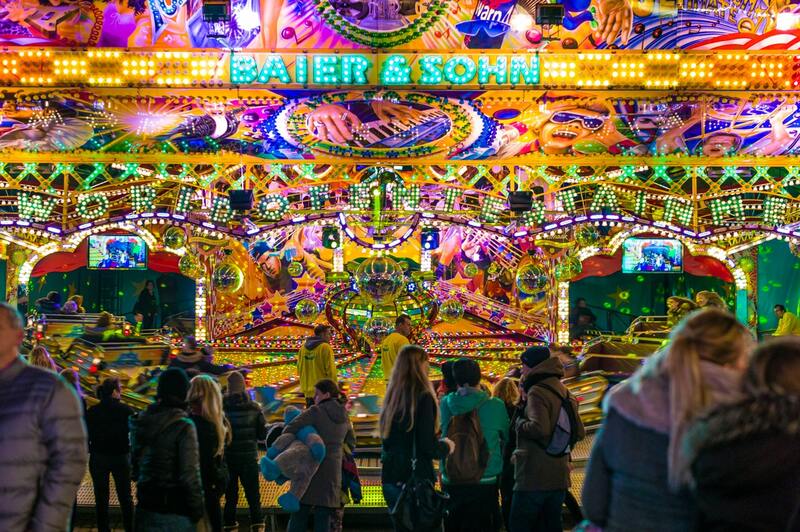 A detailed glossary of these types of rides is available at the end of this post. Now, if you’ve taken a good look at the Attraction Inventory chart, you’ll notice a large category called ‘Other’. Simply put, this 18% is a mixed bag of attractions that make each waterpark unique. 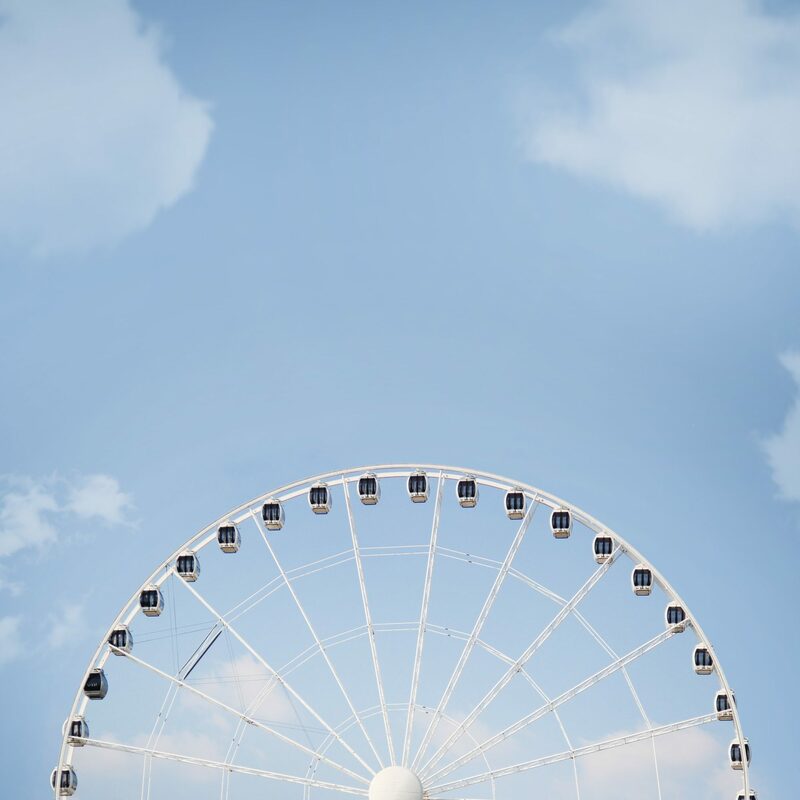 These include arcades, roller coasters, rides borrowed from typical theme parks, interactive ropes courses, beaches, volleyball courts, cabanas, wildlife interactions, and so on. Hardware-wise, waterparks around the world seem to have much of the same “stuff”. More than 80% of waterparks around the world have at least a bodyslide, a pool, and a play structure. More than 70% of waterparks have a raft or tube slide, and the same percentage have a river of some sort. This residual 18% is where waterparks express their individuality. Now, what is the implication of the above? Simply put, you can use this to build a waterpark. This knowledge can rather easily be applied to basic, high-level waterpark planning and design. 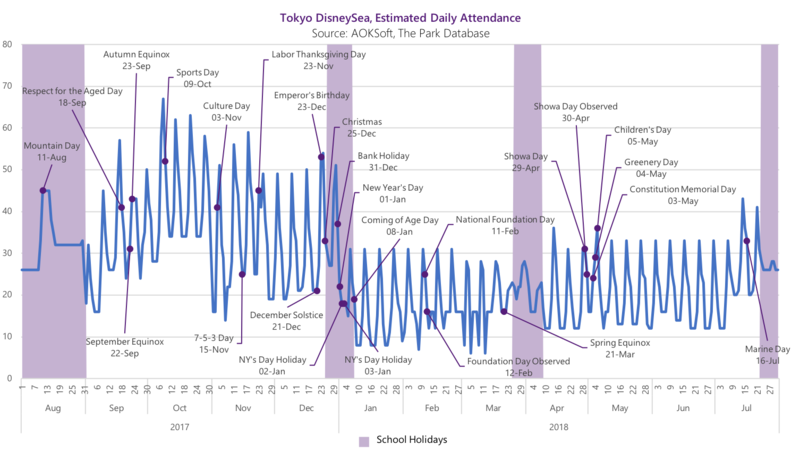 Every attraction in a waterpark – or any theme park too, for that matter – has an hourly capacity associated with it. Hourly capacity is a measure of how many people can be accommodated on the ride or attraction every hour. This is based on calculations that take into account the number of seats and simultaneous riders, the interval time of each vehicle, and the number of vehicles/rafts/cars. Different manufacturers will quote theoretical capacities based on slightly differing interval times, but for most waterpark slides, the interval time tends to be between 15 and 30 seconds. This means that a rider or a raft is released from the top of the slide every 15 to 30 seconds. Bodyslides – 180 people per hour, per lane. This is based on a 20 second interval time. Multiply by the number of lanes to generate the total hourly capacity. For example, a 5-lane speed slide would be 5 x 180 = 900 guests per hour. Raft/tube rides – 120-180 people per hour, per lane. Rivers – more than 1,000 people per hour, depending on the length. Pools – this depends on size, but can range from 100 to more than 3,000+ for the largest wave pools. For more on this directly from the source(s), you can see that the top waterpark equipment manufacturers quote capacity numbers directly on their website. These hourly capacity numbers are guidelines to help you plan for a waterpark project correctly. Have too many attractions, and you’ve overbuilt – fun for the consumers, less for your pocketbook. If you have too few attractions, you simply won’t be able to accommodate the guests who show up at your park. Your target capacity is the total number of attraction experiences you’ll be able to deliver to your guests, per hour. This is the sum of the hourly capacities of the individual attractions. Once you’ve determined your target capacity*, it’s time for the fun part. Use your knowledge of the above capacities, and the typical breakdown of waterpark attractions, and mix and match until you’ve hit the target capacity number. *The planning department of the waterpark manufacturers above (Polin, ProSlide, Whitewater) should be able to give guidance on this. Our in-house attractions and theme park consulting team is also standing by, ready to help. This exercise is meant to be a high-level starting point behind the thinking that goes into planning a waterpark. It is not a substitute for actual design expertise. For those considering a waterpark, we highly recommend engaging a planning firm early. The discussion thus far has focused on the hardware of a park: the attractions, rides, and built components that make up a waterpark. For the record, we would like to make it clear that hardware does not a waterpark make. It’s just the starting point. 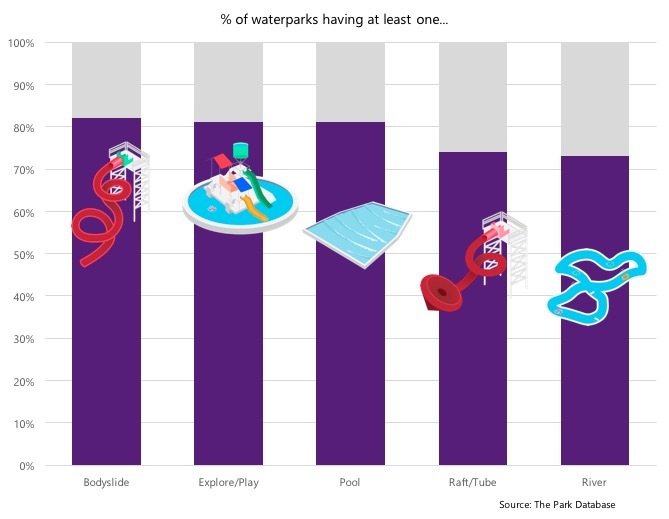 If there’s anything our analysis shows, it’s that the most successful waterparks in the world are not distinguished by the fact they have unique attractions and rides that no other waterpark has. In fact, it’s just the opposite – with more than 70-80% of waterparks in the world sharing the same basic components of slides, pools, and rivers, what makes a waterpark successful and unique are the entirety of: hardware, service levels, theming, attention to detail, layout, and design. As a side note, this is a large part of what makes the waterpark range of development costs much more narrow, and smaller, than theme parks. While outdoor theme parks can range in development cost from $300 million to $5 billion+, an investment of $80 to $100 million in a waterpark would qualify it as being truly mega in scale, with most waterparks able to be constructed for between $10 and $40 million. Exceptions exist, of course, with the smallest water playgrounds at $1 million or less, depending on the size and location of the land. Much of this is subject for a later post, but the soul of a theme park in general isn’t in the uniqueness of rides, but in the entire experience. Sometimes the experience correlates with scale, but many times it doesn’t. What makes Blizzard Beach and Typhoon Lagoon able to attract more than 2 million visitors per year to their waterparks? Some of it is undoubtedly due to scale, but stellar service and attention to details, such as a high level of theming, and service details such as the ability to reserve private umbrellas, patio service, and ability to bring in F&B undoubtedly play a role. What makes Chimelong Waterpark in Guangzhou the highest attended waterpark in the world? 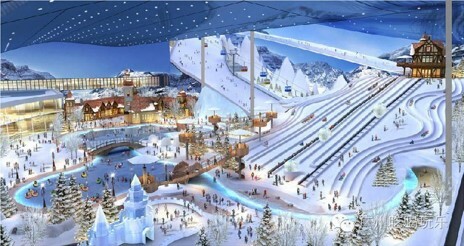 For a start, it pioneered the waterpark concept in China and has a larger size than most waterparks. But it also deserves credit for rethinking the concept of a waterpark in general, by offering shows and beach club-type events into the evening. What makes Waterbom in Bali, despite its 4 hectare size, one of the highest rated waterparks in Asia? Guests consistently mention surprisingly excellent food, spa services, and theming that provides an escape from the surrounding city as the reasons why Tripadvisor named it Asia’s leading waterpark. What makes Atlantis in the Bahamas unique, for a resort waterpark? Its unparalled theming and landscaping, a lush environment that provides a seamless experience between guests staying at the resort and the attraction, and a deeply-considered depth of placemaking that often leave guests feeling that a single day was not enough. What makes the Cartoon Network Amazone in Pattaya unique, despite its quite ordinary 5-6 hectare size? Besides being one of the first waterparks in Thailand, it made use of an IP whose television channel reach in Thailand, as well as Asia in general, outranks that of Nickelodeon or Disney, and through a visionary founder, was able to convince the brand to invest in its first ever location-based entertainment destination. As we always advocate in this business, there’s an 80/20 analysis in planning or analyzing a waterpark. As waterparks tend to share many of the same components, identifying the hardware components is often the easy part. Designing an experience that makes a project truly unique is where the effort is. We’d like to give an especially warm thanks to our data and infographics partner Daily Infographic, who helped us create the special charts and infographics summarizing this post; please see their work below, and be sure to visit them for any commissions. Slides that are ridden skin-to-slide. Loop – An enclosed bodyslide that drops riders into a full, semi-vertical loop. The existing iterations of this ride and not quite as legendary as the vertical one at Action Park, but close. Very close. Drop – bodyslides that are notable for their vertical descent, at a steep angle. Speed Slides – multi-lane slides where riders race each other down the slide. Note the difference between this and the Mat Racer, below. Bowl – these are more common as raft or tube rides, but bodyslide variations exist. The major feature of the slide is a ‘toilet-bowl’ looking feature where riders are spiraled and ‘flushed’ down an exit chute. Mat Slides and Mat Racers – slides where riders lay in a face-forward riding position on a foam mat. Mat racers are speed slides with mats. Enclosed – partial or wholly enclosed slides have a higher thrill factor; primarily from the fact that you don’t know where you’re going! Slides where riders sit on a raft or tube. Rafts are generally forward-facing, tubes are generally inward-facing (riders face each other). Simultaneous ridership is generally 2 or more, up to 6. Tubes have no forward ‘direction’, the tube rotates. Water Coasters – a modern development using water boosters, LIM, hydromagnetic, or conveyor belt technologies – to boost riders on uphill sections of the ride. Boomerang – for lack of a better term, these are half-pipe slides that refer to the shape of the major feature. Riders end up in a half-pipe shaped section of the slide and make several swings or oscillations up either wall before exiting. Sometimes called walls. Bowl – the raft and tube variation of the bodyslide bowl above. Riders spiral down an exit chute, in the movement pattern of being ‘flushed’ down a toilet. Funnel – these offer an experience that is a hybrid of the above boomerang and bowl types. The major feature of the ride is a large funnel. These resemble bowls tipped to its side. Riders enter the funnel and make several alternating swings up the sides/walls of the funnel until exiting from the narrow end. These are also sometimes called walls. These are attractions that soak up capacity, and are often a leisurely transport mechanism that allow guests to reach different areas of the park. Lazy River – the drifting, more leisurely variation of the two major subtypes of rivers. A gentle current pushes riders, most often in inner tubes, around the course of the river. Various entry and exit points allow riders to access different areas of the waterpark. Wave River – the more aggressive of the two major subtypes. At certain points along the river, a machine provides a sudden surge of water. Riders in the vicinity of the impact zone are propelled forward, and the swell bobs riders up and down to a greater degree than in the lazy river variation. These go by various names. They are essentially playgrounds with slide, obstacle course, and jungle gym elements. 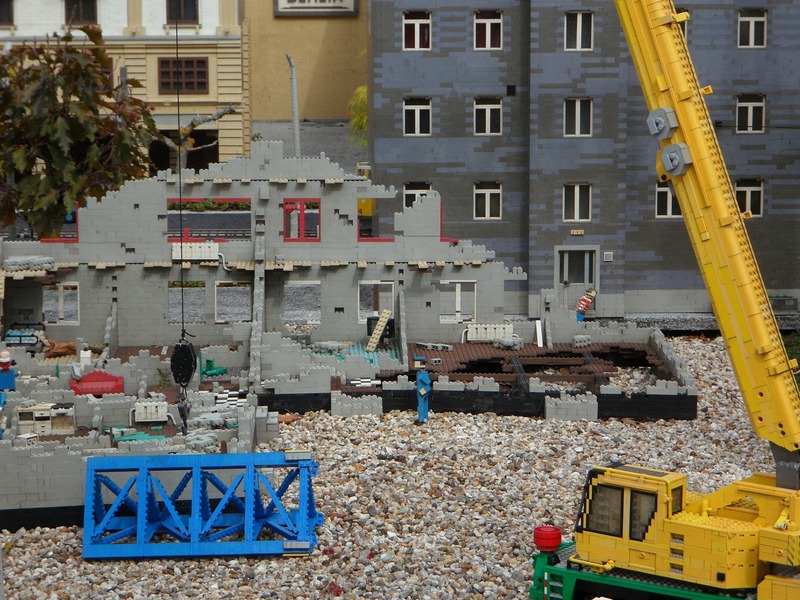 These range from large fort/fortress-type structures to smaller playgrounds for toddlers. Common elements of these structures include shooting fountains, water guns, bridges, slides, water buckets, and ladders/ramps. They are often considered waterparks in miniature. These are most commonly segmented into the static and non-static (wave) types. Wave Pool – similarly to the wave river, a wave machine occasionally generates a surge of water, creating swells that are several feet high. The waves move from the deepest point of the pool to the beach, where guests can enter the pool. Static pools vary in their complexity, and range from small dipping ponds to large lagoon structures with rockwork, fountains, waterfalls, and other elements of environmental design. Jacuzzis and hot spring variations are also common. Other types of attractions include Flowriders, artificial wave machines, spa and sauna features (especially in colder climates), and even coasters or typical theme park rides. Other features include beaches, lagoons, spa services, or even typical theme park rides. Indeed, at Yas Waterworld in Abu Dhabi, the most mentioned element is actually a suspended coaster that cuts through the park.